A 400,000-year-old stone object unearthed in Morocco could be the world's oldest attempt at sculpture. That is the claim of a prehistoric art specialist who says the ancient rock bears clear signs of modification by humans. The object, which is around six centimetres in length, is shaped like a human figure, with grooves that suggest a neck, arms and legs. On its surface are flakes of a red substance that could be remnants of paint. The object was found 15 metres below the eroded surface of a terrace on the north bank of the River Draa near the town of Tan-Tan. 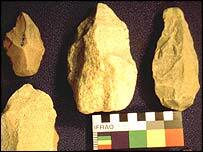 It was reportedly lying just a few centimetres away from stone handaxes in ground layers dating to the Middle Acheulian period, which lasted from 500,000 to 300,000 years ago. The find is likely to further fuel a vociferous debate over the timing of humanity's discovery of symbolism. Hominids such as Homo heidelbergensis and Homo erectus, that were alive during the Acheulian period, are not thought to have been capable of the symbolic thought needed to create art. Writing in the journal Current Anthropology, Robert Bednarik, president of the International Federation of Rock Art Organisations (IFRAO), suggests that the overall shape of the Tan-Tan object was fashioned by natural processes. But he argues that conspicuous grooves on the surface of the stone, which appear to emphasise its humanlike appearance, are partially man-made. Mr Bednarik claims that some of these grooves were made by repeated battering with a stone tool to connect up natural depressions in the rock. "What we've got is a piece of stone that is largely naturally shaped. "It has some modifications, but they are more than modifications," Mr Bednarik told BBC News Online. Mr Bednarik tried to replicate the markings on a similar piece of rock by hitting a stone flake with a "hammerstone" in the manner of a punch. He then compared the microscopic structure of the fractures with those of the Tan-Tan object. However, Professor Stanley Ambrose of the University of Illinois, Urbana-Champaign, US, said he saw no evidence for tool marks and that, although the figure was evocative, it was most likely the result of "fortuitous natural weathering". "[Mr Bednarik] has effectively presented all the information necessary to show this is a naturally weathered rock," Professor Ambrose told BBC News Online. Professor Ambrose points to Mr Bednarik's observation that some rocks in the vicinity of the figure were weathered and even rounded from transport by water. Professor Ambrose believes that rocks and artefacts found at the site could have been disturbed by flowing water in the past. Mr Bednarik also observes that flecks of a greasy substance containing iron and manganese on the surface of the stone could be red ochre, a substance used as paint by later humans. "They [the specks] do not resemble corroded natural iron deposits, nor has any trace of this pigment been detected on any of the other objects I have examined from Tan-Tan," writes Mr Bednarik in his paper. A 200,000-300,000-year-old stone object found at Berekhat Ram in Israel in 1986 has also been the subject of claims that it is a figurine. However, several other researchers later presented evidence to show that it was probably shaped by geological processes. The Tan-Tan object was discovered in 1999, during a dig directed by Lutz Fiedler, the state archaeologist of Hesse in Germany. Walking With Cavemen: Where did we come from?